A scaffold will allow your workers to reach high, out of the way locations throughout your construction site. While a scaffolding rental is very convenient, scaffold equipment can also pose a safety threat to workers if it is not used with the utmost care. A company that specializes in scaffold rentals will be able to provide you with comprehensive safety information about how to protect your workers from falls and other accidents. Here is a guide to some tips for keeping workers safe on scaffolding. A safety inspection needs to be performed before a worker uses the scaffold. During a safety inspection, your workers can look for any signs of instability in the scaffold setup. It is also important to check the areas surrounding the scaffold for signs of hazards, such as electrical wiring or other materials. Routine safety inspections will dramatically increase the safety of your scaffold use. Along with having your workers inspect the scaffold before each workday, you will also want to provide safety training for all of your employees. Scaffold safety training will cover the basics of how to safety work on and around a scaffold. Making this training mandatory for all workers will ensure that each one of your employees is prepared to work on the scaffold safely. A disorganized or messy worksite can quickly become a safety hazard. When materials and tools are left on or around a scaffold, they could be at risk of falling and causing serious bodily harm. To protect your workers around the scaffold, you will want to keep each level of the scaffold clear from excess materials or debris. To learn more about the basics of scaffold safety, contact Scaffold Resource by calling (301) 924-7223. For the past twenty years, we have provided quality scaffold rentals serving Washington, D.C. For more information about different types of scaffolding rentals that we can offer for your project, be sure to get in touch with our team. 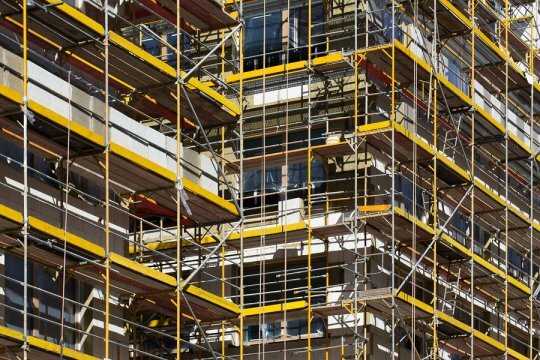 If you are gearing up for a renovation project for your business, you may want to consider scheduling a scaffolding rental . When you rent, rather than buy, your scaffold equipment, you can rest assured that your scaffold is safe and properly maintained. A scaffolding rental will take the hassle and stress out of setting up and maintaining your own scaffold equipment. Here is a look at three reasons why your business should consider renting scaffolding. One of the top benefits of a scaffold rental is that working with a top quality scaffold rental company will ensure that you receive excellent services throughout your project. A scaffold rental company will work closely with you to ensure that you have received the correct scaffold for your job, and they will also maintain an ongoing relationship with you throughout the duration of your project and beyond. Safety is very critical during a construction project. Since workers are elevated very high in the air when they are using a scaffold, you will want to make sure that your scaffold has been correctly erected and meticulously maintained. Renting a scaffold will ensure the safety of every person who works on or around the scaffolding equipment. Scaffolds come in many shapes and sizes, and different types of scaffolds are suited to particular jobs. By renting your scaffold, you will be able to make sure that you are able to choose the right equipment for your needs. A scaffold rental company can evaluate the scope of your project and help you find the right size of scaffold. For answers to your questions about the benefits of scaffold rentals, contact Scaffold Resource by calling (301) 924-7223. We have provided our high profile clients with quality scaffolding rental services in Washington, D.C. , and we can offer you a variety of scaffold resources. We look forward to learning more about your upcoming project.